The title seems a little like it cancels itself out since no one really likes computer errors, yet throughout history, some historical computers (like the humble IBM Personal Computer XT) had errors that are fondly looked upon compared to the much harder to solve ones today. The result of low or insufficient memory during a game (yes they used some back then, and 640K was all you got, and you had to really fine-tune your Config.sys and autoexec.bat files to make enough lol) or other program, it was kinda funny since the computer should be excellent at math, many times faster than a human, yet it tells us it divided by zero, which we all know is wrong. 3. The current date is January 1, 1980, enter new date. The result of an old computer (such as the XT, 286, 386) with a bad CMOS battery, or a DOS machine with the same problem or due to not being Y2K compliant (lol, the only real problem with that year, certainly not the apocalypse we all heard about). 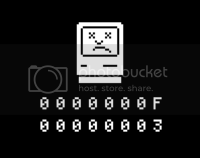 the error is a default to a date known in popular culture as the date of the first IBM PC release. even today the error resurfaces on PDAs, some smart phones (such as after a bad firmware update or faulty ROM) and even CECBs with bad memory (which makes the program guide wrong and also displays that date and 12-midnight on the display). The predecessor to Windows 95/98's 'Illegal Operation and WinXP's 'Program has encountered an error and will now close', it means the program either terminated due to an address conflict, or low memory, or IMO, you were using America Online! Funny since the wording cancels out the whole message. it had only an OK button to dismiss it, and your program in question. While it appeared windows was still working fine, you had about 10 seconds to save your work and get the heck out. for a long time people on LANs wondered 'just WHO is this NT/Authority/System and what gives him the right to shut down my computer?!' but it was the most aggravating part of the MS Blaster worm. 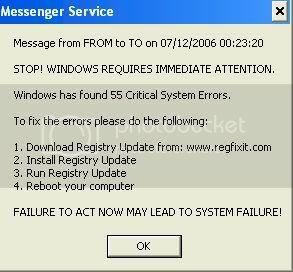 what happened was a critical windows service, the RPC service, which still elludes me as to what purpose it serves, is designed to restart the computer if it is ever terminated, whether by a virus, spyware, or the user with no skills with the 'End Process' function in the task manager. even though one can circumvent the problem by going into Control Panel-->Services-->Remote Procedure Call and changing 'Restart the computer' to 'Do Nothing' it won't stop the worm. seems like only yesterday. 2. Unidentified Network "Local Access Only" (Windows Vista, all flavors) the most common part of wireless networking in Vista, while not historic, it's common and happens on previously working laptops using WI-FI and DHCP IP Addresses with routers. why it happens and why Microsoft still hasn't fixed it, is a mystery. but what happens is it fails to get an IP address and therefore no gateway or DNS server addresses from the router, and results in a local connection to the LAN, but no internet available, i.e, the 'local access only'. 'Unidentified Network' is the translation of your computer failing to get an IP address/gateway/DNS address in a given time period. unfortunately all the Vista boxes i've helped fix here do it indefinitely once it happens. what one needs to do is go into networking, wireless network connection, disable the check mark in IPv6, go to IPv4 properties, and enter the static address of the computer, router, and DNS. while it makes going from hotspot-to-hotspot annoying with having to manually reconfigure each time, there's currently no real fix from Microsoft nor explanation as to why the router stops allowing Vista to get an address when it worked previously. So what's your favorite historical or current computer error? "No keyboard present! Press any key to continue"
Yeah the '301 KEYBOARD ERROR PRESS F1 TO CONTINUE' is rather stupid and redundant. "An Error has occurred in your application, if you choose ignore, you should save your work in a new file. if you choose Close, your application will terminate"
Who said Macs never crash again?! and i think they were more cryptic than Windows errors.